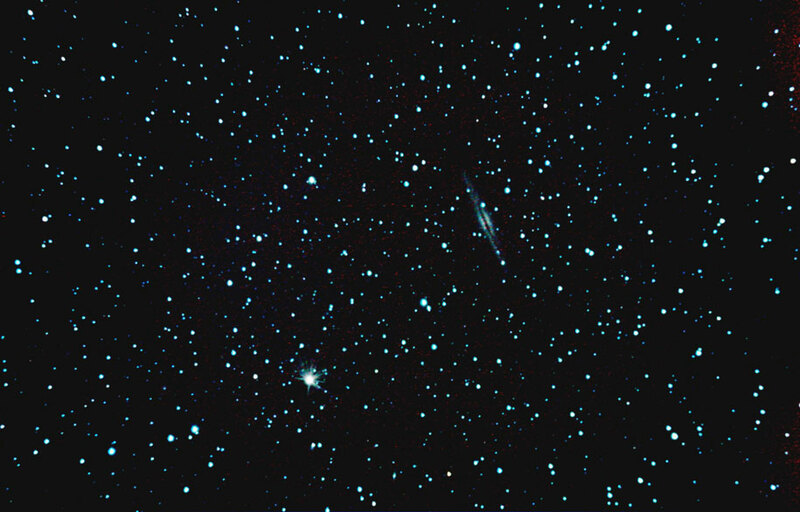 Caldwell 23 (NGC 891) lies in the two o'clock position from the centre of this image captured by Chris Newsome during the early hours of the 25th August 2006. The image was taken with a Canon EOS 300D camera at the prime focus of a Celestron C8-NGT telescope guided by a Meade DSI camera through a Skywatcher 80T refractor and using a GPUSB interface controlled by MaximDL. It is a stack of five 300 second exposures at 400 ASA combined in MaximDL and then processed in CS2 using curves, RGB levels, a Gaussian blur and a highpass overlay. 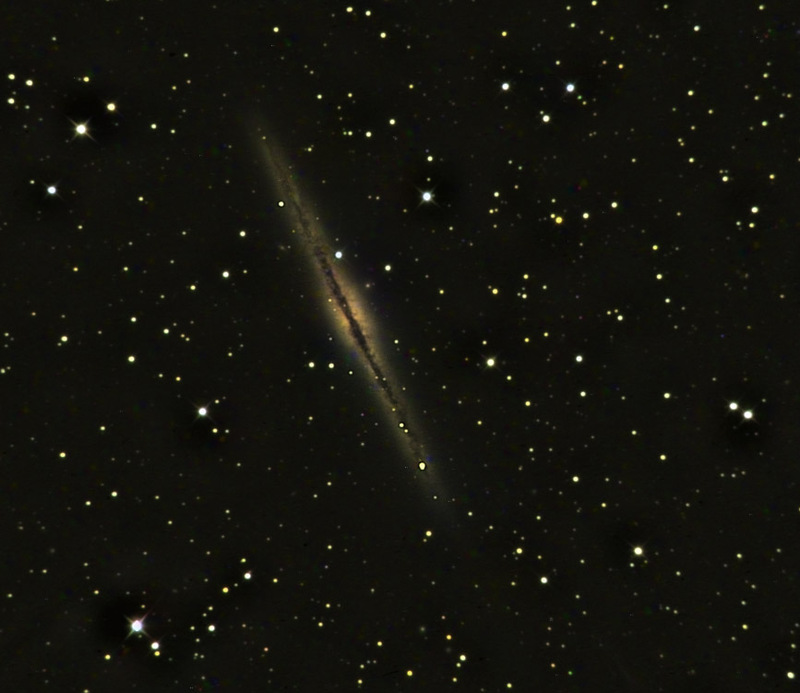 Adrian Brown captured the following incredible image of the galaxy Caldwell 23 (NGC 891) at about 9 o'clock this morning British Summer Time on the 29th October 2005 using a robotic telescope located in New Mexico! The equipment used was a Takahashi Mewlon 300 Dall-Kirkham Cassegrain telescope on a Paramount ME mount. The camera was a Finger Lakes IMG1024 CCD. The exposure details are 10 x 90s luminance, 10 x 45s red, 10 x 45s green and 10 x45s blue. The image was stacked and colour combined in Maxim DL and Adrian did the final sharpening and colour balance work in Photoshop. Adrian writes: "The observatory where the telescope is located has the rather dodgy sounding name of 'Rent-A-Scope' RAS observatory, but the system actually works very well and is very easy to use. It's also located at a very dark location and you don't need long exposures to get an image. When you log on to the system you can choose from 4 telescope systems, assuming no one else is using them, and you can control the telescope from a web page. Any images you take are automatically downloaded to an FTP site so you can download them at your leisure without using up your allotted telescope time. There's also a weather page with an "all sky" camera and cloud cover data so you can keep an eye on the weather. It was quite interesting to see how very expensive equipment performs. The pointing accuracy is exceptional. I just entered NGC891 into the control software and the scope centered the galaxy slap bang in the middle of the CCD chip - I wish my setup worked as well as that! It's also interesting to note that the Mewlon suffers from the same amount of coma at the edge of the field as my refractors even though it costs £10,000! Makes me a lot more content with the optical quality of my own scopes. It costs $99 for an initial 3 hours of telescope time, thereafter it costs $65 a hour which is pretty expensive as you can easily use up an hour getting the sub exposures. I don't think I will be using it much as I could see this could get very addictive and very, very expensive but the introductory offer of $99 is not too bad - just £18 per hour to play with £26,000 worth of equipment. Personally, I prefer to be out under the stars rather than being remote but it could be useful to take pictures of stuff we can't see from here. The observatory is 20 degrees further south than the UK." Adrian has also taken a picture of The Crab Nebula with this robotic telescope facility.